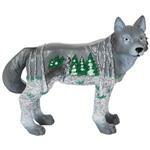 The Lone Wolf Mini Figurine is ready for gift giving this Holiday Season. It comes in a printed Call of the Wolf box. This Wolf figurine is made out of solid resin, hand painted and raised on the side of the Wolf is a winter forest scene with a howling Wolf.